Glasgow Warriors are optimistic of reaching an agreement with the city council to lay a synthetic pitch at their waterlogged Scotstoun home. The Pro12 club have had to switch their European Champions Cup game against Racing 92 to Kilmarnock's Rugby Park. 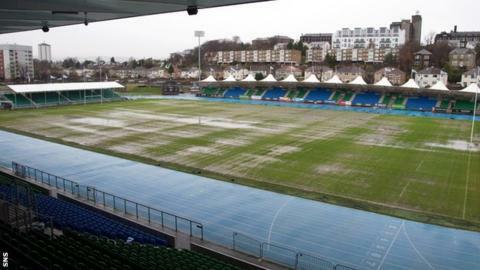 It is the third time this season that Scotstoun, owned by Glasgow City Council, has been deemed unplayable. Glasgow coach Gregor Townsend welcomed the prospect of installing a pitch he believes would suit his side's style. "I am a big fan of this type of surface, given the wet weather that comes to the west of Scotland," he told BBC Scotland. "We haven't had the surface all season round to play the rugby we want to play. "To have a change to that would be great. To be able to play and not have games postponed would be a huge bonus too." Cardiff Blues are currently the only Pro 12 side with a synthetic pitch, which they installed ahead of the 2013-14 season, following the lead set by English Premiership champions Saracens at their Allianz Park home. "In the matches we have played at the Blues, I have enjoyed playing on a surface that you know is going to be consistent every time you play on it," said Glasgow wing Lee Jones. "I think it could really benefit the team." Glasgow managing director Nathan Bombrys said they are "very close to a breakthrough" over a new pitch. "It is important to note that Scotstoun is a multi-sport facility and it also hosts athletics events," he told BBC Scotland. "It is owned by Glasgow City Council and it's done pretty well for us. We are a tenant but have been able to make Scotstoun feel like home, but it has a weakness. "When we get wet weather, the pitch does struggle and our expectations and requirements have grown." Bombry said negotiations are continuing with Glasgow Life, the agency that runs the facility for the council, about an artificial surface. "The way forward for us would be to get a 3G pitch in there," he said. "It would give us a good surface to play on and to train on and would open up opportunities for the community and for athletics to use it as well. "Where it falls short is that it is not conducive to throwing javelins and hammers on it. We are looking for solutions with Glasgow Life." Bombry explained that, although there would be financial implications, the decision was taken early to switch the 23 January game to Kilmarnock to allow supporters plenty of time to make arrangements. "Scotstoun has been flooded a number of times with the heavy rain," he said. "The rains have been phenomenal. It does drain away, but it leaves a very unstable surface and then we get more rain and it is under water again. "We have had multiple different expert groundsmen look at it for us and, by not playing or training on it for a while, we hope it will recover. "We are not going to have a game of rugby there in a week's time and we thought we had a good facility available at Rugby Park." Bombry pointed out that, should Glasgow win at Northampton on Sunday, the final pool match against Racing could give his side a chance to reach the quarter-finals. "We were already heading for a sell-out and we can accommodate a few more people at Rugby Park," he added. "It should be a good arena for a big game in European rugby."